This is part of a series of blog posts for the 2013 Society for Neuroscience Annual Conference. You can see all the other posts here. I remember my first time at an SfN annual meeting. Overwhelming is a gross understatement. Back then I had way too much enthusiasm, way too little training and no concrete project of my own. I went in with the solid determination to take in as much as I can. There is NO way you’ll be able to attend every session, talk or poster you’d like to see. Especially when everything sounds interesting. Add in the pressure of trying to network (if you’re an introvert like me) or establish collaborations, and the experience may even deteriorate into terrifying. Prepare in advance. It’s close to impossible to get the best out of SfN without some serious planning. The meeting planner is your friend. Use the search function (it’s not Google unfortunately, so choose your terms wisely). Then when you have time, browse the itinerary – I always discover things I missed. Hubbian is an alternative planner that's free to use. It lets you build and save multiple abstract lists and is mobile compatible. You can also upvote abstracts and see how many times they've been viewed in the Hubbian system. Prioritize! I can’t stress this enough. Ask your advisor and senior graduate students on which topics to REALLY focus on; generally, this would be related to your project. If you have a project that solidly fits into a theme, then you’re lucky (say, Huntington’s). Check out abstracts of posters under that theme; list then from highly relevant -> less so. Unfortunately the meeting planner doesn’t have that function; so write it down. Limit the number of posters you see in a day; the more you see the less you remember. If you have time by the end of the day (which you probably don’t), look through your notes or discuss what you’ve seen with your peers. Helps you remember. Freebies. I usually scout out the exhibitioners during lunch break or when my brain needs a rest. Don't go when they’re still preparing. Tote bags and pens are a-plenty; cooler swag generally include T-shirts (I think F1000 gave some out last year), pipette-shaped pens, posters, pins (Elsevier has them), notebooks (Nature Publishing Group often has those), brain-shaped squeeze sponges and neuron plushies. Word-of-mouth is generally the best way to know what this year’s pickings are. 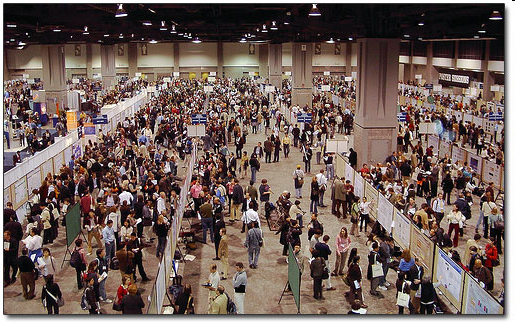 Twitter is also a good source of info – follow the hashtag #SfN13, many vendors tweet. If you take their stuff, don’t grab and run. Talk to them. I especially like talking to people from publishing houses – about open access, journal subscription, working in journal marketing etc. It’s a nice break from science and an opportunity to get a first-hand account of work options beyond the bench. Socials. The one that I make sure I go to every year is #SfNbanter. It’s organized by the GREAT! @doc_becca and always attracts a wide group of social media savvy-neuroscientists, science journalists, editors and publishers. Great conversations. I’m met MANY of my personal sci communication heroes there. I can’t recommend it enough. If you're still confused, PDW07.Getting the Most Out of SfN: The Annual Meeting and Beyond (Saturday, Nov 09, 2013, 1:00 PM - 2:00 PM) might be worth checking out. Passport and US dollars if you’re international. Comfortable shoes. You’re going to be doing a LOT of walking (I averaged around 30766 steps per day last year) so bring the best you own. Flip-flops are ok! Poster tube strap (see left). I got this idea from @scicurious. Last year I used a present-wrapping ribbon and clipped it in on both sides; tape also works. You can free up a hand for other luggage, plus it makes your poster tube easier to find. Chargers for your devices. Wifi tends to be a bit shaky at the convention centre causing battery drain. I always make sure to have one on me at all times. Edit: Dr. Tim Murphy has kindly provided additional advice from a PI's point-of-view. Two things stood out for me: meet your funders, and get excited! 1) Have a plan before you go. Use all modern tools available, itinerary planner, perhaps new, even social media tools that may be available. Share your itinerary with others in your lab to make sure all the relevant presentations are found. Make sure you search key people in your field and search on particular methods you may want to explore. 2) Learn something new, branch out. I’ve seen too many people making rounds of posters of their colleagues at their own university. Make a concerted effort to see new work. 3) Fuel up; make sure you have enough food and water for the whole day. The Convention Centre food and drinks are notoriously bad and overpriced and there are long lines. Convention centres seem to be at least 5 km from reasonably priced food. I typically buy a sandwich in the morning of the conference and take it with me along with some drinks and extra food. This allows me to get through the day and to see some key posters between 12PM and 1PM as the take down and put up time is often a quiet period over which one-on-one questions can be handled. 4) Dress comfortably and wear comfortable shoes. This sounds obvious, but one can walk at least 10 to 15k within the Convention Centre. One thing limiting you getting the most of the meeting is fatigue. Also, in a related note, try to plan your movement through poster sessions, so that you avoid backtracking. 5) Every day and every session has something truly amazing; there are no afternoons or mornings off. You all have given some oral presentations and you know how much time is put into this. Celebrate the presentations of others. If you are tired and you’ve seen enough posters, camp out in a symposium; perhaps learn something new, that is related to your topic of research. This is our opportunity to catch up on a lot of research. A few years ago in New Orleans I decided to go out to an evening presentation and had a joy of hearing Christopher Reeve speak. Sadly, this joy is no longer available. 6) Meet your suppliers. This is a great opportunity to ask technical questions from camera or microscope manufacturers or any manufacturer in that regard. 7) Know your funders. Quiz the people at CIHR/NIH about their programs and way they see trainee funding going. Give them feedback. 8) Get excited, empower yourself. There are two ways of looking at the meeting: first is that it is extremely intimidating. There are 30,000 neuroscientists here. The other way to look at this is: “This is exciting; I’m a part of the group of 30,000 doing cutting edge research on the brain”. 9) Take lots of notes. Perhaps, the easiest thing to do is to pick up an old-style composition notebook and write a few notes on each poster. This will go a long way in jogging your memory afterwards. 10) De-brief after the meeting. When you return to your home lab, tell people of what was good and what you learned. Also, share with your PI both strengths and weaknesses of your own work that you learned about by presenting your poster. Above all, enjoy yourself and use the meeting as a key professional development experience that it is meant to be.